12 tracks: Ashes * By The Arafura Sea * Song For James * Absolution * In Flanders Fields * Reg Evans’ Cradle * When An Angel Appears * Home Is The Hero * A Toss Of The Coin * Roll Call * Glory Days * Don’t Throw Away Your Dreams. 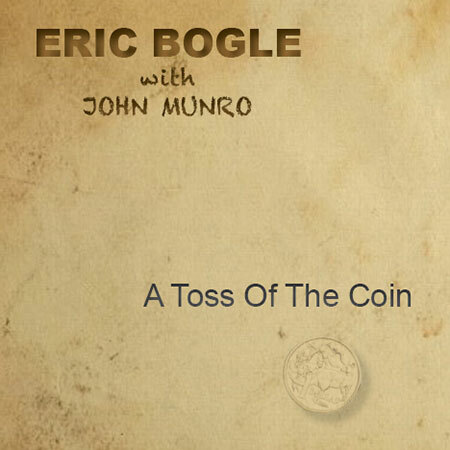 In 2009 Eric Bogle completed his final tour of the UK and Europe, and now confines his touring to Australia and New Zealand, which is of course a huge loss to his legions of British and North American fans. These fans will, however, be very pleased to learn that Eric has not given up song-writing and recording - and A Toss Of The Coin testifies to that. This album again confirms that he is one of the best and most prolific songwriters of the last several decades. This album takes a slightly different direction to Eric’s most recent recordings in that Eric sings ten of the songs, while John Munro not only contributes two new songs but sings them as well. Of Eric’s songs, seven are entirely works by him, one other is a poem to which Eric has written the music, and the remaining two are songwriting contributions by friends. As usual, Eric’s songs reflect the times we live in and recent world events. The first song - Ashes - was written after a visit to Strathewen, Victoria, Australia, ten weeks after the ‘Black Saturday’ bushfires of February 2009 in which 173 souls perished. It is dedicated to Dave Magahey, Captain of Arthurs Creek and Strathewen Fire Brigade. This is yet another classic from Eric’s pen and ranks with his all time greats, including a personal favourite: As If He Knows. But this is not a one-track wonder album. Just listen to Song For James, about a young Irish lad knocked down and killed by a truck, and his father’s subsequent efforts to help keep his son’s memory alive. Then there is Reg Evans’ Cradle, another powerful and emotional song rising from the ashes of the Black Saturday fires. Eric has also put music to John MacRae’s widely known First World War poem In Flanders Field, bringing the poem to life. The two songs written by friends Mike O’Callaghan and Pete Titchener/June Harrison - When An Angel Appears and Don’t Throw Away Your Dreams respectively - emphasise that Eric also knows good songs when he hears them. We all know how good a songwriter John Munro is, and Greentrax had the great honour a number of years back to release an entire album of John singing his own songs, Plying My Trade. His two contributions on this album - Absolution and Glory Days - are excellent and confirm, if confirmation is needed, of Eric’s admiration for his loyal sidekick’s work. John Munro (guitars, mandolin, ukulele and vocals) as always features greatly in Eric’s line-up of studio musicians, which also includes the talents of Emma Luker (fiddle, cello), Damien Steele Scott (electric basses, piano, guitar), Pete Titchener (guitars, vocals) and Jon Jones (drum, percussion), amongst several other guests. A formidable line-up. Peter Titchener also recorded the album and co-produced it with Eric. Greentrax is proud to continue to release the work of Eric Bogle, with whom a great relationship exists.